THE AFTERMATH OF A BRAND NEW EPISODE!!! Flash! News from the DARK VAULT OF PUBLIC DOMAIN!!! The creation of new episodes has commenced. The first of the new crop was shot just days ago. 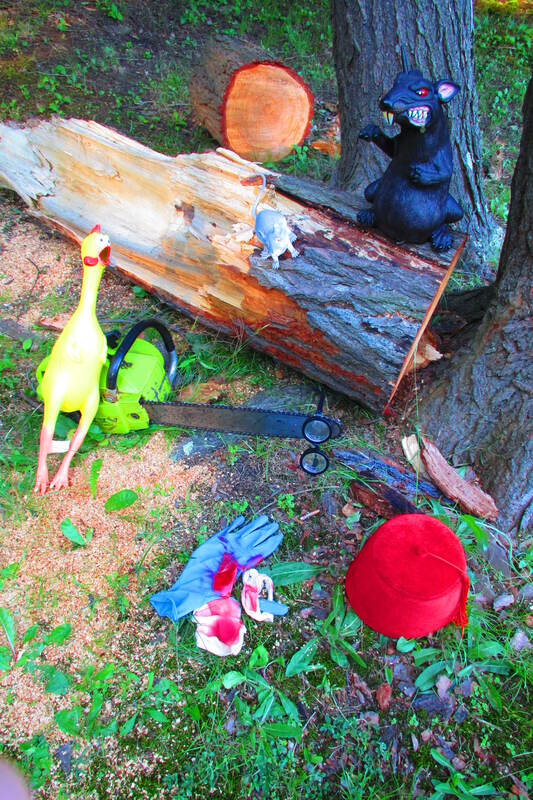 It involved a large tree, a rubber chicken, a chainsaw, and some blood here and there (and there and there). More new episodes have been planned out and will be completed this summer with the plan to begin airing them this September when we will celebrate the Tenth Anniversary of THE DARK VAULT’S first broadcast. There are plans for special media coverage of our first decade and an announcement of at least one new place to watch the DVOPD (and a secret BIG announcement even we’re not sure off!)! So keep your eyes peeled and pointed right here for more announcements as we figure them out! Big doings in THE DARK VAULT OF PUBLIC DOMAIN!!! ~ by UNCLE PETE on July 4, 2017.